Be The Match and Why Race Matters Kick-Off Event! 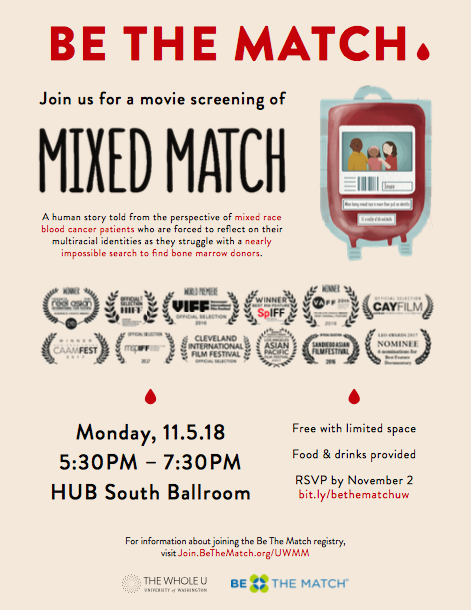 Monday, Nov. 5, 2018, 5:30 – 7:30 p.m.
Join The Whole U and UW and community expert panelists in exploring the role race plays in medicine and the essential need for multiethnic donors worldwide at a free screening of Mixed Match on November 5 from 5:30 p.m. to 7:30 p.m. at the HUB South Ballroom. Mixed Match is a human story told from the perspective of mixed race blood cancer patients who are forced to reflect on their multiracial identities as they struggle with a nearly impossible search to find bone marrow donors.This live action and animated film is a dramatic journey focusing on the main characters’ struggles to survive against incredible odds. The event will also feature a panel discussion with filmmaker Jeff Chiba Stearns, Alexes Harris (professor of sociology at the University of Washington who benefitted from a bone marrow transplant), and more!